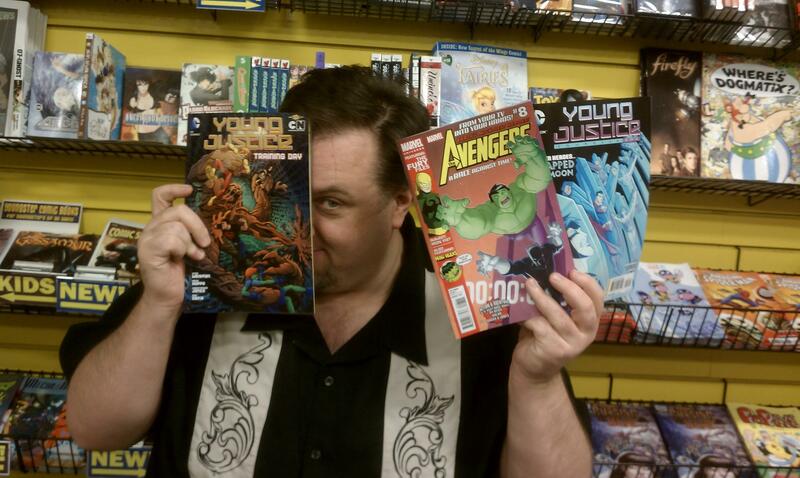 Christopher Jones is a Minnesota-based comic artist and illustrator who has worked on a multitude of different comics and books, including properties from Young Justice to The Avengers: Earth’s Mightiest Heroes to Doctor Who: The Third Doctor. Due to his having worked on a few things that I am a fan of, I was pretty pumped when he graciously took some time out of his day to answer a few of my questions. Philip Coler (TCG): For people who don’t know exactly what you do, can you describe it to us? Christopher Jones: Well, I am a comic-book artist, and the properties I’ve worked on include a number of DC and Marvel comics. 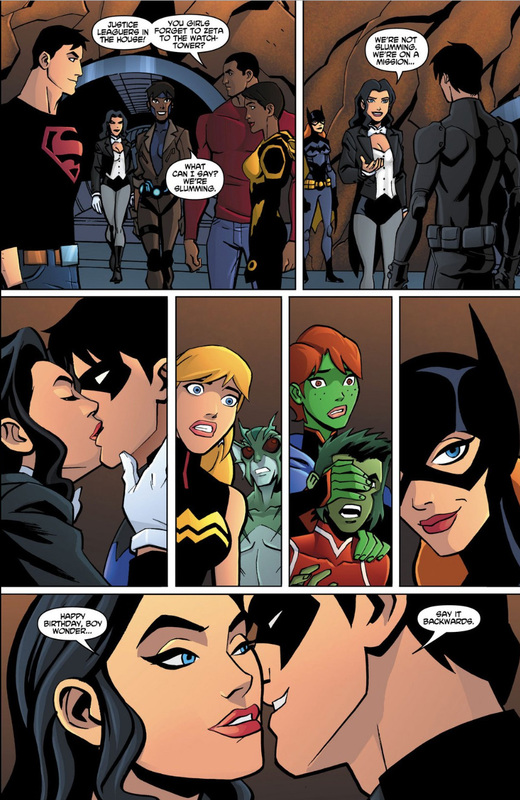 I worked on the Young Justice comic series, which was the tie-in to the animated TV show of the same name. I have actually done a lot of comics based on animated series. It’s kind of like being typecast as an actor; once you get known for doing something, that’s a lot of the offers you get after that. So I’ve done tie-ins for Justice League, The Batman, Avengers: Earth’s Mightiest Heroes—but I have also done other mainstream superhero stuff, and plenty of science fiction and horror. 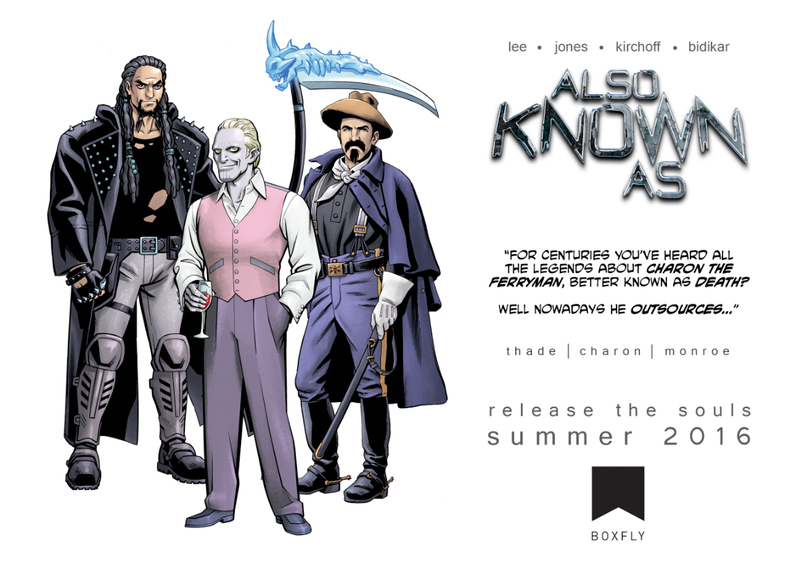 I just finished working on a sci-fi/fantasy graphic novel called Also Known As, which is an original property, so no one has heard of it yet. I’m also currently drawing the Doctor Who: The Third Doctor miniseries written by Paul Cornell for Titan Comics. So I am breaking out of that animated mold, but it’s also me helping work on some of these new properties, so that is an exciting change of pace. TCG: So it’s important for you to change it up a bit? Christopher: Aside from the career-path thing, I want not to forever be only the “based on a cartoon show” guy. 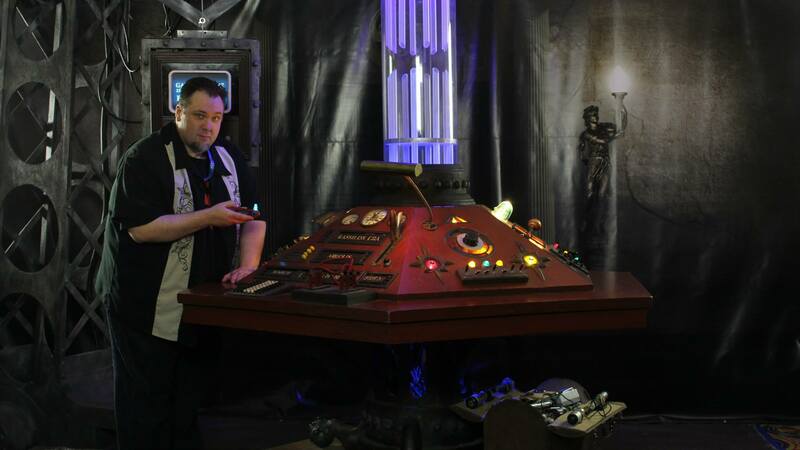 Working on things like Doctor Who and Also Known As are a chance for me to do something that’s a different genre, and a chance to work with different talented people. 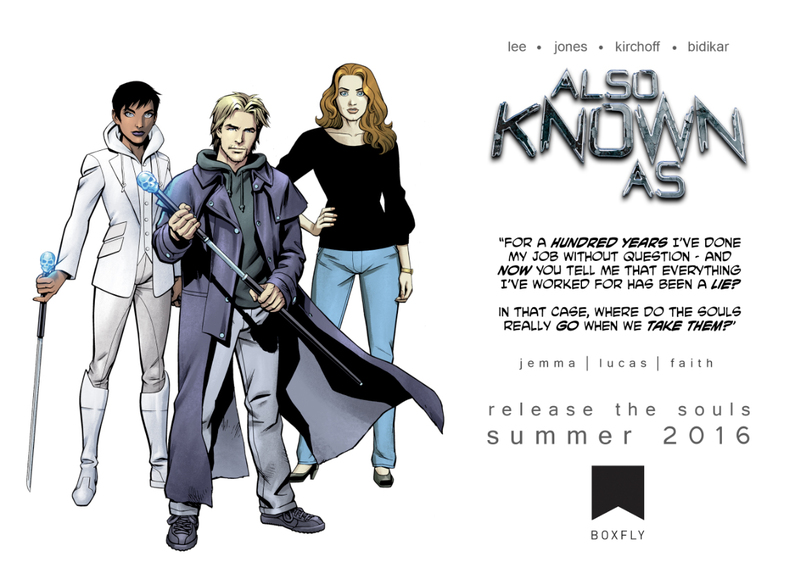 Also Known As is written by Tony Lee, who is a screenwriter and novelist and wrote a bunch of the Doctor Who comics that IDW did. 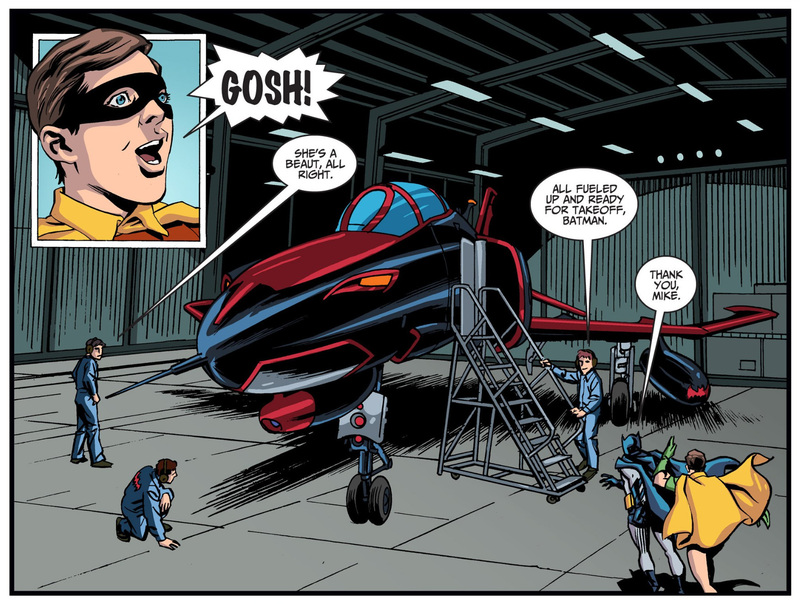 It’s being colored by Charlie Kirchoff (also originally from Minnesota), who colored Doctor Who, Judge Dredd, Dirk Gently, and lots more for IDW, Image, and Marvel too. The lettering on the book is some of the best I’ve ever seen, by Aditya Bidikar. 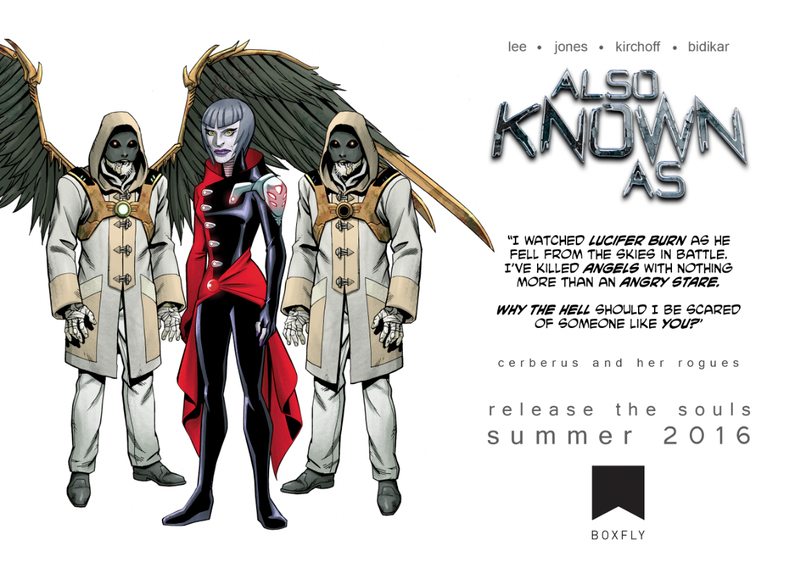 In addition to the graphic novel, it is being developed as a feature film by a UK production company called BoxFly. The graphic novel was premiered at San Diego Comic-Con International 2016 and is going to be released worldwide in September. It should be an exciting month. If you’d like to read the first 20 pages of Also Known As for free, you an do that over on Comic Book Resources. TCG: You had me at Doctor Who. Besides Also Known As, are there any projects you would really, really like to work on? Christopher: I’m definitely interested in finding new opportunities to create original properties. That said, it’s not like I’m sitting on any pet projects. Greg Weisman, who I worked with on Young Justice—he and I have wanted to do another project together since that series ended, and the challenge is funding. It’s very hard. Drawing a comic book for me is a full-time job, to be able to pencil and ink an issue a month, so it’s very hard to do something like that on spec without having a publisher willing to pay a living wage for doing the work. We haven’t yet been able to find the situation where where we would be able to set aside a block of time to do that. As a near lifelong Whovian, drawing an official Doctor Who comic book has been on my bucket list for a long time—as has working on something with Paul Cornell—so I’m pretty happy to be doing that right now. And I feel like I’m definitely bringing my own style to it, while making sure to include lots of detail that really feels like the source material. I think Third Doctor fans will be very pleased. That said, I love DC and Marvel superheroes, and I would love to do more of that stuff and just have more of an opportunity to put my own stamp on it. When you’re doing something that is based on an animated show, you’re not just having to have to draw recognizable versions of these characters but also having to specifically emulate or invoke a particular art design for those characters—you are trying to capture the look of the show. And while you still bring a certain amount of your own style to it, there’s not as much opportunity for self-expression as when working on something that’s not based on a TV show. TCG: So it can be relatively difficult for you to separate your personal style from an already established animated TV show look? Christopher: Yeah, if you have a really trained eye you can see the style of the individual artist doing it, but it’s definitely camouflaged by the fact that you’re trying to follow these character models. When you work on a book like that, they often provide you with model sheets for the characters—the same ones that would be used on an animation team to make sure that all the people doing storyboards and the actual animation on the show are consistent at drawing the characters, since dozens or hundreds of artists are doing the drawings for the animation. You’re on the one hand trying to be true to that, while on the other bringing enough of your own style rather than just mechanically reproducing these model sheets. Part of the interesting challenge, then, is you do have to create additional characters that are specific to the needs of the story you’re telling, and you have to be able to create original characters that blend with the style of these other characters presented by another artist in someone else’s style. You’re still bringing your own sense of composition and storytelling and all the other things that a comic artist is always doing, but the first kind of thing is harder for someone to see unless they really have an eye for it. I often describe art as having the layers of surface detail, which is what most readers would notice—here, the style of how someone draws a face in the look of their line work—but then there’s the stuff underneath that that is your sense of composition and your sense of storytelling and drama and mood. All of this applies when you work with a book for which all of the characters have been designed for you. But like I said, it’s almost as if a camouflage has been put over the artist’s original style. TCG: So let’s say you’re developing your own character. How would you develop the look of that character? Christopher: Look at style, as far as whether you want to try to go for something that’s very detailed and realistic or something that is a little loose and cartoonish. I kind of like something in the middle, ideally, because I think it’s silly to work in a medium like comics and not want to take full advantage of the expressiveness, but at the same time a lot of the animation-based stuff I’ve done has not been quite in what for me would be the sweet spot. 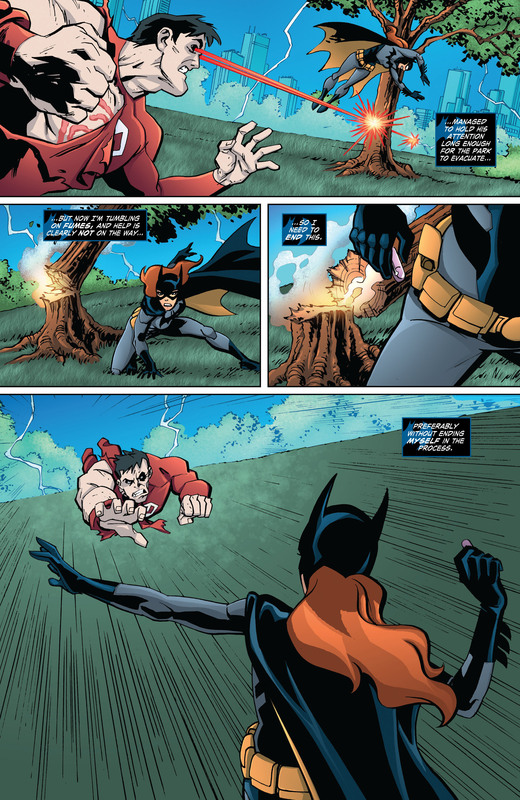 Animation tends to be very simplified in style due to the demands of animation, and then you’re taking the designs and putting them in comic books and suddenly you’re in a medium that has different demands, like when I was working on Young Justice. I tend to put in a lot more detail and text than you would normally see in a book like that. You can do that and still try to be true to the animation design, although the designs on the show are a lot more realistic and detailed than, say, the Bruce Timm stuff that I emulated when I was working on Justice League Adventures. Once you have the stylistic thing out of the way, the rest is really dictated by the needs of the story. You are trying to figure out, is this a story that is very exaggerated and larger than life in its action, or is it really human-realistic? Do you have a small handful of characters or do you have multitudes of characters? Are you doing subtle emotional nuance or a big action story in broad strokes? Sometimes you are dealing with stories that have mixes of those. But those are the kinds of things that influence the decisions you make on design. When you design the character, you are designing the tool that you are going to use to tell that story; what the story you are telling is determines the ideal form of those tools. TCG: Are there any major influences on your work, your style, or the way you do things? Christopher: I don’t know if there is any individual or even a shortlist of artists who I consciously have ever modeled my work on, but definitely the people who got me excited when I was first exposed to comics have a lasting influence. I grew up reading superhero comics from the ’70s and ’80s; I was very much looking at artists like John Byrne, George Perez, Gil Kane, Jack Kirby of course, Gene Colan, and all these different people. They all have different strengths, and you can learn different things from them. John Byrne was huge and did a lot of my favorite books during my aforementioned comic-screening years—there is a simplicity and directness to his storytelling that I definitely see in my own work. David Mazzucchelli was doing a run of Daredevil, and then Frank Miller came back to the title, and they collaborated on a title called “Born Again”—and then the two of them went of and did Batman: Year One. David Mazzucchelli kind of blew my mind as far as some of the rendering he was doing. He had such a sense of grace and movement on the page; I remember studying that for a while. I don’t know if you would look at my stuff now and see any of that in my work, since it all gets mixed in a blender and sublimated. TCG: So is the influence of other artists on your style a subconscious process, then? Or have you been able to look at styles you like and kind of combine them all into the way you do things? Christopher: Constantly as I see new artists, I will see things that I admire, and occasionally there will be something that I specifically identify as “I like what this person is doing, and maybe there is something I can learn from that.” But often it is so different, and you really can’t spend too much time comparing yourself to other people’s work or trying to find ways of specifically copying something they are doing, because you will drive yourself crazy. If I went and tried to copy somebody else, I would never be any better than a second-rate copy of them anyway. You can learn lessons from people, but you really have to find your own style and what works for you. TCG: I was checking out your blog, and I noticed you frequent comic-book conventions. What would you say is your favorite thing about going to those conventions? Christopher: The thing you have to understand about the life of a comic-book artist is that you do most of your work in solitude. You are in your studio, and you very often never meet the people you are collaborating with on a book, because you will get sent scripts by email and your communication is by email or by phone. You are really cut off from both your peers and your audience. So the great thing about traveling to conventions is getting to see everybody, whether it is fans or other people. It is a really weird business, and it is an entire industry that relies on people with little studios that are usually little bedrooms in their homes. They are off doing their own thing, and we only see each other when we come out to do signings at conventions and other events. So there is a lot that I enjoy about doing conventions; I wouldn’t do as many as I do if I didn’t enjoy them. Just having that connection with people, whether it’s peers or fans—that’s definitely number one. TCG: Besides doing the work you do for a living, what sorts of hobbies do you have when you find the free time for them? Christopher: My work is hands on and creative enough that when I have down time, it tends to be more passive. I really love movies, and I just have a great time getting together with friends and talking or watching films or something like that. After a day of drawing, I guess I don’t feel a great need to sit down and then go build a ship in a bottle or some other thing that would also be really delicate, time-consuming, engaging work that would strain my eyes, hands, back, and everything else when I spend all of the hours of my day at a drawing table. TCG: My last question is, do you have any words of advice to the Twin Cities geek community? Christopher: Well, speaking specifically to anyone who might want to work in comics—though this applies in varying ways to any kind of creative endeavor you might want to follow—just start doing it. Don’t wait for the perfect opportunity to come along to do your dream project for a huge audience and get paid. Start building experience and skills for yourself. Things have changed so much since I started my career. The circumstances are different now; there is an opportunity with the Internet and social media to reach an audience as a solo creator that wasn’t there in the same way 10 or 20 years ago. So yes, if you want to do comics, whether you are a writer or artist or whatever creative thing you are doing, just start doing it. You are not going to be able to make a comfortable living at it right away, but start doing it in your spare time. Honestly, if you are not passionate about it or dedicated about doing it on the side until it gets more lucrative, then it probably isn’t going to happen for you. I heard something about acting recently and thought it applied to comics too: if you have to ask, “How do I get started doing blank?” it is probably not going to happen. The question is, what could have stopped you? I don’t know how I would ever quit wanting to draw and tell stories with artwork. There is some flexibility, whether that is doing comic books or working in animation—I can see a few things I would be happy doing—but I love telling stories, and I love doing it through art. Whatever degree of success I have doing it professionally, more money and more exposure and more creative freedom is great, but I would still be doing something regardless of what success I had. So get out there and start doing. Create a web comic, create something. If you are writer and don’t know how to draw, go to conventions or go on deviantArt and look for people in the same position as you to partner up with and start making something. With the act of creating something, not only are you going to get better but you’re going to have this body of material that you will generate, and then you’ll have a track record of producing stuff. You will also meet people, which is valuable networking, and that leads to more opportunities. You need to have faith that you will get better at it and have more opportunities as you go. You can’t wait for the perfect opportunity land in your lap. If you do that, you will just keep waiting. You can learn more about Christopher Jones and view his artwork on his website, on Facebook, and on Twitter.